Obama Lowers Expectations For Copenhagen. Now What? On Sunday, Obama finally acknowledged what was becoming agonizingly evident: There's just no way world leaders are going to hammer out a legally binding global climate treaty at the Copenhagen summit in December. A few countries, like Britain, didn't seem overly thrilled with the concession, since the talks next month could just drift along aimlessly if no one feels any urgency. (Diplomats, like college students, thrive on waiting until the last possible minute.) Still, Obama's correct. The Senate hasn't passed its own carbon legislation—which will likely drag out until next spring—and it's impossible to have a credible, binding treaty when U.S. commitments are still so hazy. 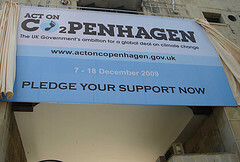 At this point, then, the United States is backing an alternate Danish plan to "try to reach a political agreement in Copenhagen that sends a strong message of intent" while "postponing many contentious decisions on emissions targets, financing and technology transfer" until meetings in 2010. It's not clear what a "strong message of intent" would entail. One possibility that's been talked about is for countries to agree to cut emissions, but fill in the hard numbers and levels later on, in the meetings next year in Germany or Mexico City. It'll also be interesting to see if a semi-agreement in Copenhagen puts any pressure on lawmakers here in the United States to pass a climate bill. If it's clear that every other country in the world is prepared to take serious steps to cut emissions, and that the U.S. Senate is the major hold-up, does that weigh on individual senators at all? I'm sort of skeptical, though Joe Romm argues that this might matter to a few Republicans like Richard Lugar or John McCain.